Interests:My grandfather - Pte. 37091 Robert Lang, 14th Bn HLI; b 25 Oct 1893 at Smyllum, Lanark; killed in action on 24th April, 1917, at Villers-Plouich; buried at Gouzeaucourt New British Cemetery, France. 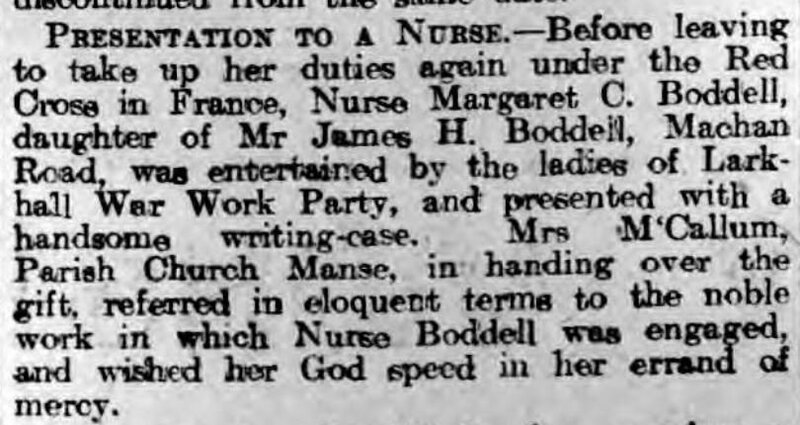 I am researching this nurse, and I have found her mentioned in 2 local newspaper items; one on 4th March, 1916, and the other on 24th April, 1918, as attached to the French Red Cross. I have her Medal Rolls (no MIC yet) for The 1914 Star issued by the 'American Ambulance Hospital of Paris' on 2nd October, 1918, showing her entry into France on 3rd September, 1914, and for the VM and BWM issued by the 'British Committee French Red Cross' on 24th February, 1918, showing her rank as 'Sister' and the 'From To' as '8-14 to 11-18'. Can someone point me to where I might find information on the French medals mentioned in the newspaper article? Sorry to gate-crash this thread, and no doubt Tom is cleverer than I and can "move the viewer", but it doesn't work for me. At bottom left I see a small image of six MICs. I hover my cursor over that and get invited to"View full size image". I click away but nothing happens. "View image" isolates the MICs, but they're still too small to decipher. Does one save the image and use a photoshop program to enlarge it? Click on the full screen icon before using the magnify option. Then move the image around the screen. It is not always possible to see everything. Ah! (Or should that be "Agh"?) Thanks. There was I trying TO enlarge & magnify the six-card image at bottom left. 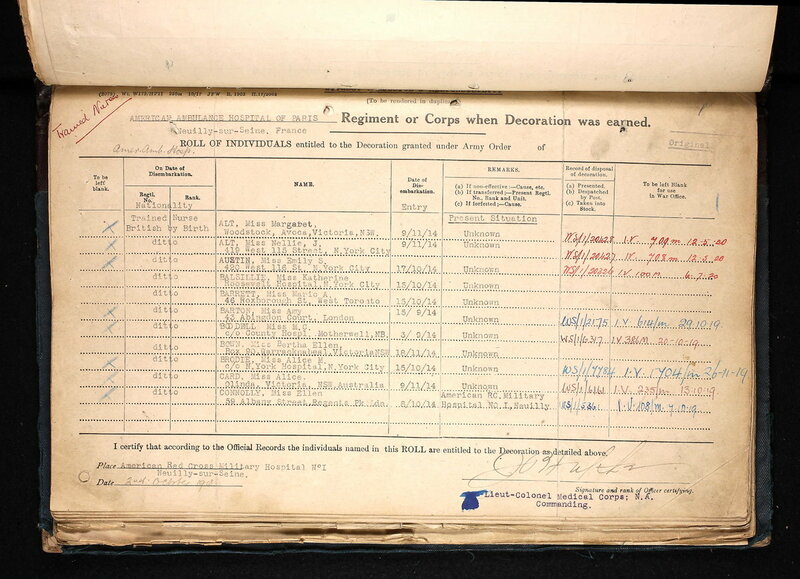 I didn't realise one should go on enlarging the larger image with all those "The National Archives" watermarks. Useful tip - nearly all my research (such as it is) into individuals is casual and doesn't merit paying for an MIC. I paid and downloaded her MIC. Is it odd that this does not show the award of the 1914 Star? I'd now also ask for help re the French Medals mentioned in the newspaper clippings above. The BRCS & St John, along with many other non military organisations, did not have to ask permission to accept and wear foreign awards due to an agreement with the British authorities. Some are mentioned on the Royal Collage of Nursing site and the British Red Cross VAD site. She is not mentioned on either. I would suggest writing to the British Red Cross to see if they have any records for her which may contain the mentioned awards. I have approx. 40,000 un gazetted awards on my database but as yet do not have her, I'm still looking, so if you do get proof of the awards please let me know so I can add them. If she was with an American Unit, she may not have qualified for the 1914 Star. The BWM & VM was with the Red Cross even though it was French, if she accepted French SERVICE medals she could not accept British and visa versa. May I draw your attention to the text of the 2nd newspaper clipping in which it is reported "... 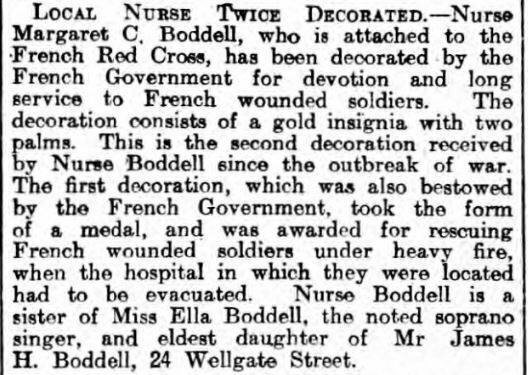 This is the second decoration received by Nurse Boddell since the outbreak of war. The first decoration, which was also bestowed by the French Govenment, took the form of a medal, and was awarded for rescuing French wounded soldiers under heavy fire, when the hospital in which they were located had to be evacuated". 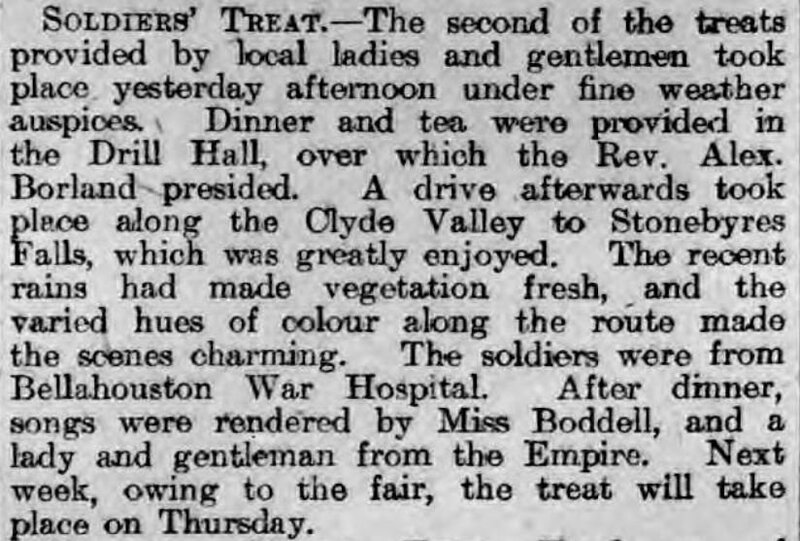 The newspaper clipping is dated 27th April, 1918, and before any Service Medals were awarded, as noted in the Rolls which are dated 2nd October, 1918, and 24th February, 1921. I contacted the British Red Cross as suggested. The Archivist replied "...Unfortunately it appears that Margaret was a member of the British Committee of the French Red Cross (formerly known as the London Committee of the French Red Cross). This Committee is a source of some frustration to me as its records appear not to have survived. They are certainly not held by the archives of either the British or French Red Cross movements and efforts over the years to track them down have been unsuccessful. ...". Any other suggestions from the Gurus? That is very sad to hear. Thanks for letting us know. The second honour, by its description, seems to be the Insigne Speciale for nurses. It consists of two palm leaves joined at the stem upon which is a tiny red-enamelled cross. An illustration, together with full description and qualifications is in the OMRS Journal of 1991 at page 206. 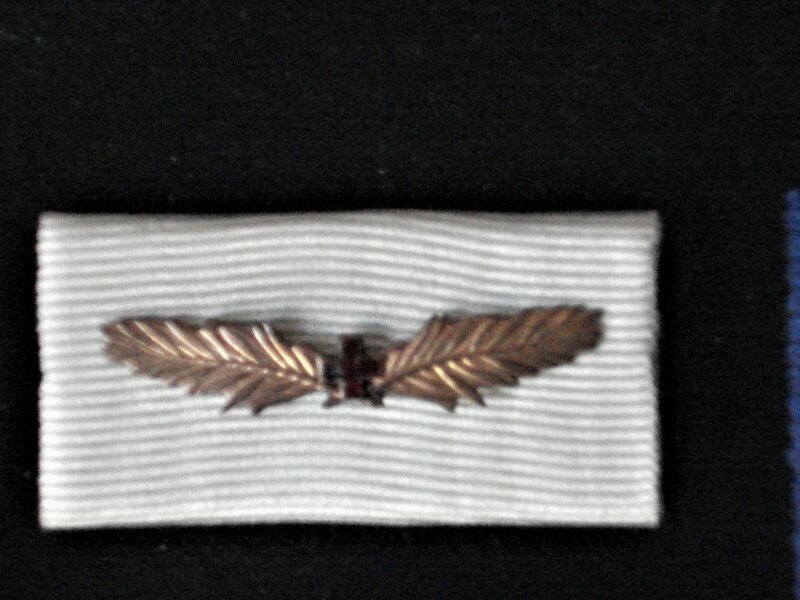 The gold version indicates three years service. Thanks for your suggestion Norman, but I'm having difficulty finding a photo. 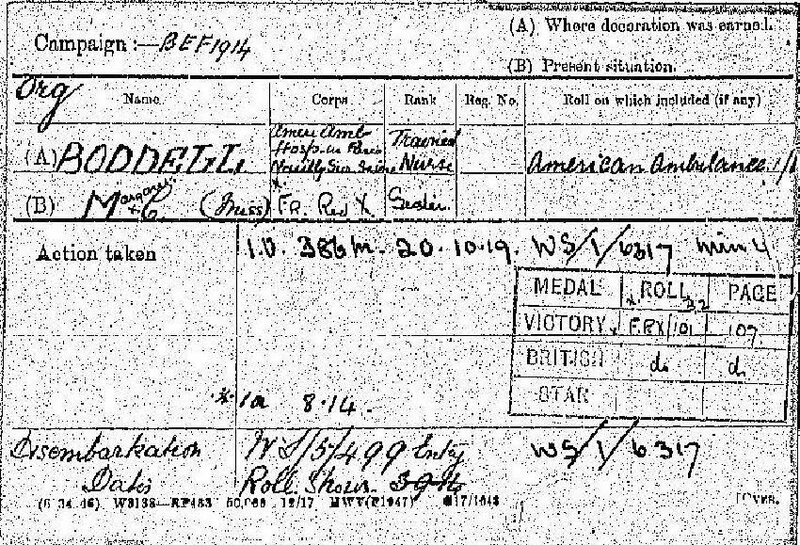 Silly question but could it be Margaret Canfield Boddell as there are Ancestry records to that name? EDIT Ignore the above question I have just found a nursing record for a Margaret Caufield Bruneau (nee Boddell) registered 25/5/1951 then living in France (full address available) having qualified at the County of Lanark Isolation Hospital in 1911. If 'Ella' is a derivative of Isabella then it may be possible looking at her siblings. 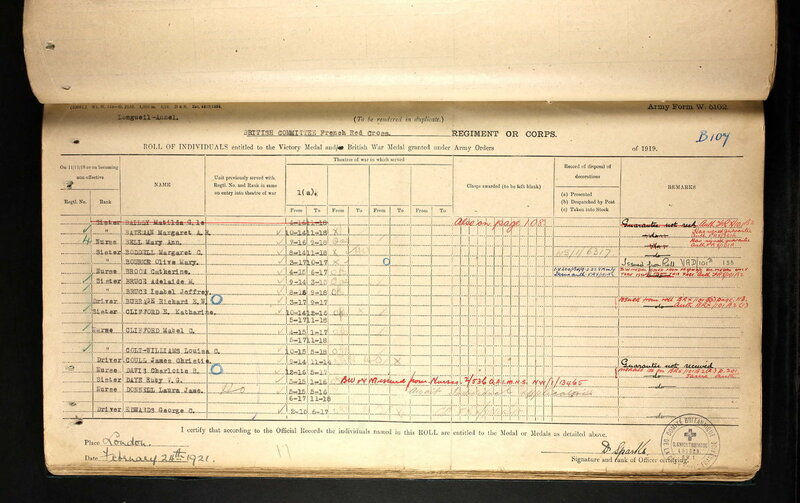 Her birth record shows Margaret Caufield Boddell, b 24th July, 1886, at Larkhall, Lanarkshire, Scotland. I'm quite sure that typos abound, so to find a similar spelling on Ancestry is quite common. I'm logged onto Ancestry right now but can't find your reference. Can you indicate which type of record you refer? I have many document regarding Margaret and her sister Isabella. But thanks for your suggestion. Within four Ancestry trees there is a ref to Margaret Canfield Boddell who has a sister Isabella. 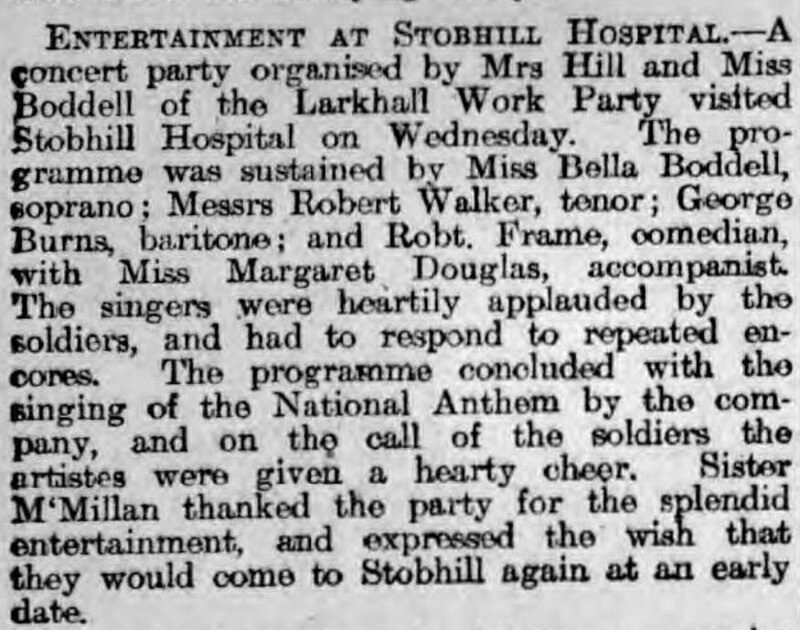 The Ella referred to in the newspaper report could be a derivative form of Isabella and she appears to have been quite famous in Scotland as a soprano. You made me search again and I found the records you refer. I'll now search for a marriage record. She (Margaret Boddell) died in 1982, in Dunoon, Argyll, age 96. Yes, her sister Isabella performed on many concerts and soirees for recuperating soldiers. I've checked the trees on Ancestry, and in my opinion, the middle name spelling is not correct. I have a copy of her birth record. ...and one researcher copies another! Yes, Ancestry is bad for that. I have found her death record on ScotlandsPeople website in both her maiden surname and her married surname of 'Bruneau'. But because of the 'recent' date of death, the record is not available online. She is also listed in 1955 at 77, Ave de Wagram, Paris, France.